Crocheted scarves make great beginner projects since you don't need to know very many stitches, and they work up fast enough to provide quick satisfaction. Scarves are also practical and attractive, and with today's fashions you can wear them year-round. These short projects are a good way to practice advanced skills on a small scale. Once you've finished the single crochet (sc) foundation row, this simple but elegant checkered scarf requires only double crochet (dc) and chain stitches. If you work the stitches tightly, the checks will angle into a cat's-eye pattern as in the image on the left; if you work the stitches with less tension, the checks will relax into a more regular pattern as shown in the image on the right. Row 1: Sc in second chain from hook. Work 1 sc in each chain (25 sc). Chain 3 and turn. Row 2: Work 1 dc in each of first 3 sc. Chain 3 and skip 3 sc. *Work 1 dc in ech of next 3 sc. Chain 3 and skip 3 sc. Repeat from * until last sc. Work 1 dc in last sc. Chain 3 and turn. Row 3: Work 3 dc underneath the chain 3. Chain 3 and skip next 3 dc. Continue working 3 dc underneath each chain 3, skipping all dc, until the end of the row. Work 1 dc in gap between turning chain and final dc. Chain 3 and turn. Repeat Row 3 until the scarf is as long as you like. Finishing: Trim yarn and weave in all loose yarn ends. Crocheted scarves come in an enormous variety of colors, styles, lengths and weights, and since you're doing the creating you're in control of variables such as wool weight and color. 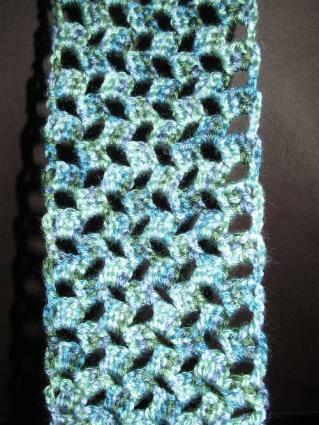 You can quickly crochet a scarf to match your favorite hat in the winter or your purse in spring. You can also alter a project's length or width by changing the number of stitches in each row, and increasing or decreasing the number of rows you crochet. In many parts of the world a winter scarf isn't just an accessory, it's a necessity. Worsted weight yarn is the most common choice for creating a warm, durable scarf. Winter Scarf Set: This simple scarf, headband and hat set is designed in washable wool. Its "easy" skill level is suitable for beginners, and the solid construction is more forgiving to errors than the lacy openwork typically associated with crochet would be. Alternating Windowpanes Scarf: You can easily adapt this scarf by choosing a different yarn, or making the repeating pattern longer or shorter. The finished design, which looks like a series of lacy windowpanes and shutters scattered across the scarf, works up beautifully. This scarf only requires knowledge of a few basic stitches, but following the pattern changes makes this an advanced-beginner or easy-intermediate project. Winter's Snow Scarf: A nice pattern for a heavily ruffled scarf that looks more difficult than it is, but still ranks as an intermediate-level project. While wearing a scarf in 90-degree heat may not be the most practical thing to do, it's undeniably stylish. Since you're the artist creating the scarf, you can choose a lightweight yarn (or even crochet thread) and airy design to help keep you cool. Scarves add a touch of color to a simple blouse or jacket. Ella Crochet Floral Scarf: The lightweight cotton yarn in this advanced-easy project makes it a good summer scarf, and the brightly colored, three-dimensional flowers on a leafy, green background will attract compliments everywhere you go. Head Cowls: Draw one of these crocheted cowls up over your head to keep you cozy, or slip it down around your neck as a scarf. The cowl pattern is easy to work and comes with multiple stitch patterns to add variety. Your choice of yarn makes this into a summer or winter project. Crazy Mixed Up Stitches Scarf: This warm-weather scarf is the perfect way to dress up a t-shirt and pair of jeans without losing your casual look. It's ranked as a beginner/easy project, and you can create a winter version for yourself by using thicker yarn. 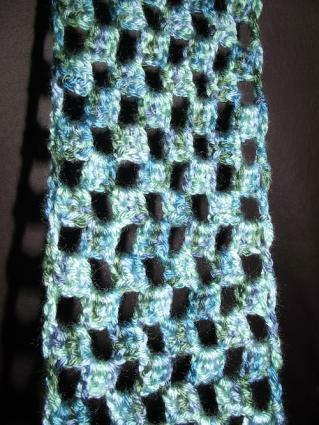 Crochet Scarves! 16 Hip Projects for Dressing Up Your Look offers patterns that one customer review describes as "pure fun." Expect loops, lace, and three-dimensional embellishments. This is especially appropriate for crocheters with some experience reading patterns. Hooked Scarves: 20 Easy Crochet Projects lives up to its name, with 20 easy patterns to keep beginners hooked on scarfmaking. From fashion scarves to winter warm-ups and wraps, the author has included a versatile range of patterns. Crochet: Learn to Crochet Six Great Projects contains six easy patterns, including a long, lacy scarf that's good for most seasons. Even if your first crocheted scarf isn't perfect, hold onto it, or at least take a picture of it, so that you can look back on it in a few weeks and marvel at how far you've come. A little practice is all it takes to get you from fumbling with your first stitches to confidently doing lacework, or even adapting patterns to suit your fashion needs. You might even start designing your own scarves! 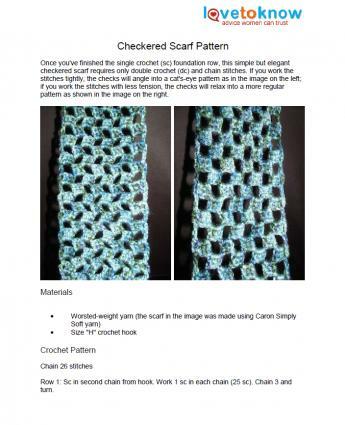 All you need is a stitch dictionary to help you choose a stitch pattern for the body of the scarf, or you can make up your own stitch combination.